Clarks boys shoes boots 8f - leather, suede, blue. Condition is Used. Dispatched with Royal Mail 2nd Class. Clarks Boys Dino Shoes 8F. Condition is Used. Dispatched with Royal Mail 2nd Class. 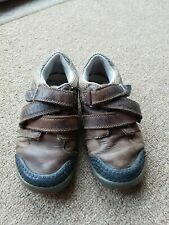 clarks boys shoes size 8F. Condition is Used. Dispatched with Royal Mail 2nd Class. Clarks Boys Stompo Shoes 8F. Condition is Used. Dispatched with Royal Mail 2nd Class. Amazing shoes. Of course I bought them without my son being present and when he wore them in the house i realized they didn't fit. but they look amazing and as he never really wore them I feel they are still new. Boys Boots Clarks Navy 8F Very Good Condition. Condition is Used but only worn a handful of times. Comes with box. Bought for £36. From pet free and smoke free home. Dispatched with Royal Mail 2nd Class. Clarks Boys Astro Trainers Size 8f Grey Silver Yellow Leather. Condition is Used. Dispatched with Royal Mail 2nd Class. Clarks Boys 8f Infant Sandals / Watershoes. Summer Shoes. Blue & Green. Clarks Boys 8f Infant Sandals / Watershoes. Summer Shoes. Blue & Green.. velcro fastening with elastic lace Excellent Condition as my son hardly wore these. box not included in sale Dispatched with Royal Mail 2nd Class. Next And Clarks Summer Shoes Size 8 & 8F. Condition is Used. Dispatched with Royal Mail 2nd Class. Clarks Boys Shoes Size Infant 8F. The shoes have adjustable Velcro fastening. Condition is Used with wear left as can be seen in the photos. From a pet and smoke free home. Dispatched with Royal Mail 2nd Class. Infant Boys Clarks Stompasaurus Boots Size 8F. Condition is Good Used. Please see my other listings for more shoes Dispatched with Royal Mail 2nd Class. Boys Black Trainers Shoes. Size: UK 8 F.
Clarks Boys Boots Size 8F (Infant). Condition is Used. Dispatched with Royal Mail Signed For® 2nd Class. Blue with yellow dinosaur head. Originally £38 from Clark’s. Collection from Langdon Hills. clarkes shoes 8f from smoke free pet free home . Condition is Used. Dispatched with Royal Mail 2nd Class. Lovely pair of Clarks Shoes, Velcro strap, reinforced toe covers, still lots of wear left in them. 'Clarks black leather shoe with velcro fastening. Size 8F, in very good used condition as they were quickly outgrown. They are a size 8F and are in my opinion in good used conditions. Boys CLARK'S FIRST SHOES . Size UK 8F. Smart casual. NEW (other) Clarks FUZZLE POP Boys Black Leather School Shoes size 8 F.
B undle of boys shoes in size 2 for ages 7-8. O ne pair of sandals - size 2. O ne pair of trainers - size 2 - F&F. O ne pair of plimsolls - size 3. Clarks Blue Combi Leather Shoes - Boys Infant Size 8F. Condition is Used. Good condition in box. Dispatched with Royal Mail 1st Class. Clarks boys' Stompojaw Inf brown leather shoes, size 8 F (infant). Otherwise in good condition. Rubber, non-slip soles. Clarks Wing Raid – Super Jet Pilots in training will love the Clarks Wing Raid infant boys school shoes. Crafted from black leather, these boys shoes are part of the exciting Jets range with aeroplane detailing adding a playful edge to a practical pair. Very light and flexible boots. Bought for £45 last year. Clarks size 8F black jet shoes with working lights. Great condition.